You can put lipstick on a pig but it’s still a pig! 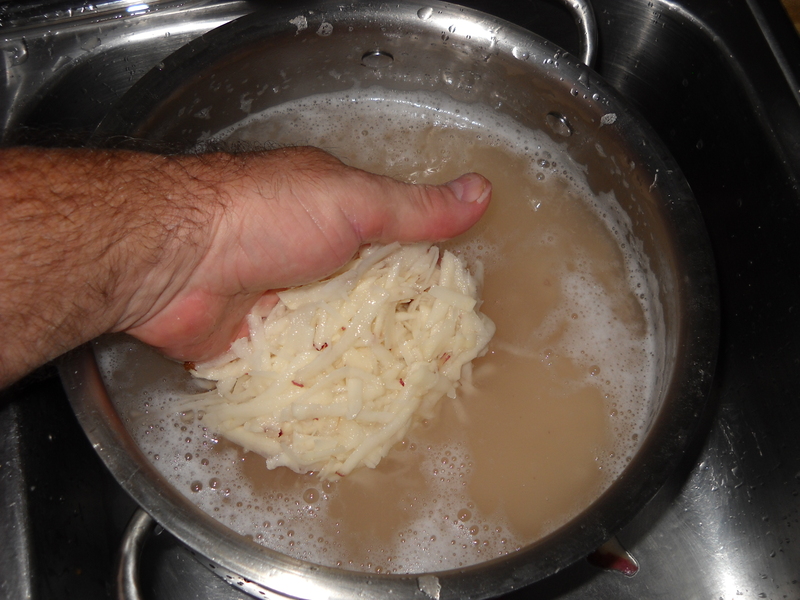 Hash browns can test the sand of any trail cook or home chef. 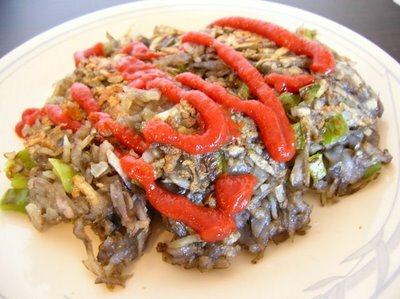 For years I fought with mushy, grey looking hash browns as I tried to get them to look like the greasy spoon would make down the road. It was pretty frustrating to be sure. In fact, I became so adept at trashing my hash browns that I switched to cooking only home fries! I tried everything. 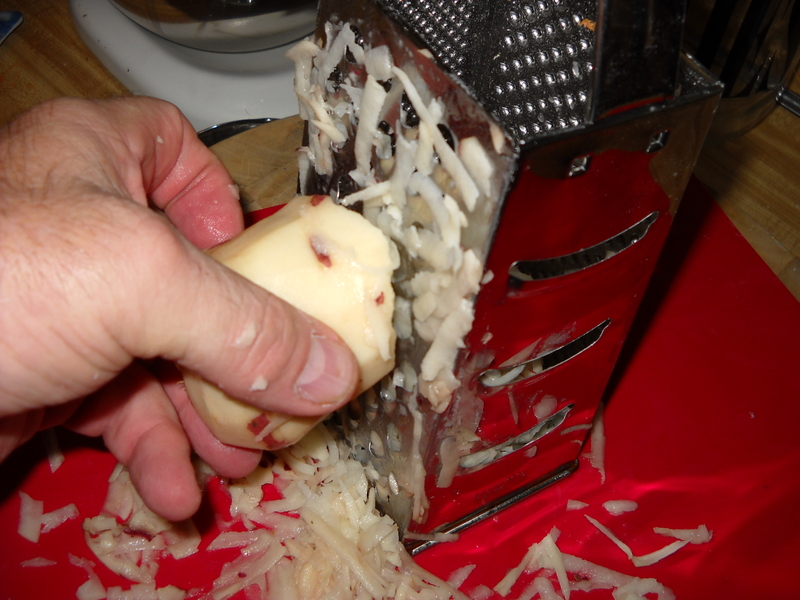 I’d heard of folks pressing raw and cooked spuds through a mechanical ricer, micro waving ‘em before frying, boiling ‘em before shredding, using butter to fry in, drying them in paper towels and oven roasting ‘em before frying. I even found out my neighbor used to run down to the greasy spoon, get a herd of hash browns to go, then place them on his family’s plates alongside their eggs and sausages. He was smart, he admitted the elusive hash brown had defeated him and was now just going with the flow. None of those tricks worked for me and I bet you all found out the same thing too. No matter what I tried, I still ended up with a grey, sticky slop. Does this sound familiar to you? What was worse is that I grew up on an Idaho potato farm in Jerome so I out’a know how to cook them, right? Not necessarily, we grew the famous thick skinned, high glycerin, high starch Idaho russet potato. To make matters worse, by now I owned and was the cook in my own restaurant. He said it wasn’t necessarily the way I was frying them but WHAT I was frying that was the problem. He told me that what I needed instead of using a starchy russet potato, was to use a potato grown largely in the eastern half of the country. My answer to my problem he vowed was to use the waxy or thin skinned low starch potato. I knew that choosing the right type of potato to cook dinners with can make or break a dish. For instance, making a stew and using a russet and not a waxy potato ends up being a mushy disaster. On the other hand, using a waxy potato to make mashed potatoes is useless. Why??? Potatoes fall into one of two categories — mealy or waxy. Mealy potatoes (Some of the names you’ll see them under in the supermarket are Idaho’s, Russet, Burbanks, Russet Arcadia, Norgold Russet, Goldrush, Norkotah and Long White.) have are thick skinned and have a high starch content, but they’re low in moisture and sugar. Waxy potatoes (red, new) are just the opposite. They’re high in moister, high in sugar but low in starch and have a thin skin. You will find them sold as Round White, Round Red, Yellow Potato, Red skin Potato and Salad Potato). There is a third type but I don’t use them much. These are an all purpose middle of the road potato. I choose to use the correct potato for the job and achieve great results rather than settle for an all purpose potato and achieve just, OK results. Some of these potatoes are named, Yukon Gold, Peruvian Blue, Superior and Kennebec. An easy way to tell the difference between the two main types is; Waxy potatoes have a thin skin, Starchy or Mealy potatoes have a thick skin. Waxy potatoes are an excellent choice for roasting, sautéing and boiling. They make great soups, casseroles, home fries and hash browns because of their tendency to hold their shape. 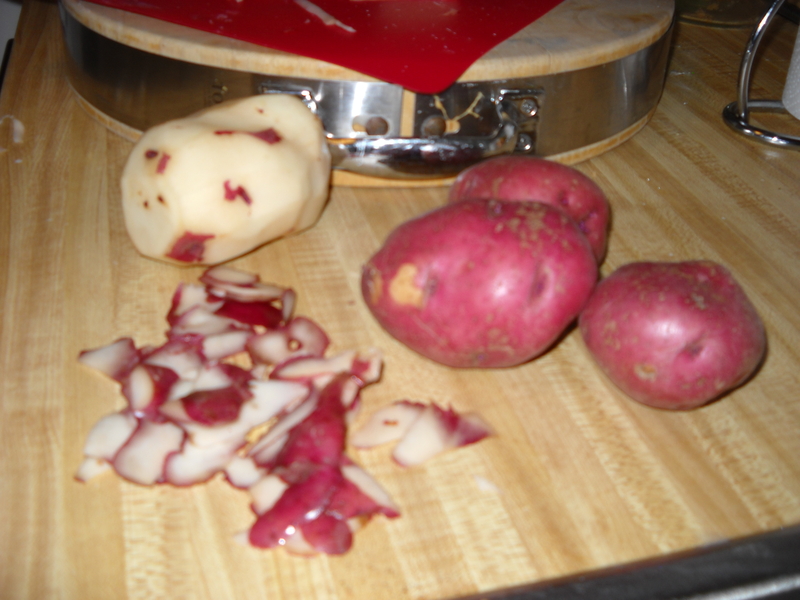 Waxy potatoes are also used in cold potato salad and scalloped or cheddar au gratin potatoes. Their low starch content and cellular makeup helps them maintain their shape long after they’re cooked. Mealy or starchy potatoes are best for baking and deep-frying. Because they’re low in sugar, they can be deep fried long enough to cook fully in the center without burning the outside with black streaks. They’re also the best choice for mashed potatoes because they fall apart easily when they’re boiled. Because they are a starchier potato with a loose cellular structure, they fluff up much better than a waxy potato. So now that you have a head full of potato knowledge go ahead and make your perfect hash browns. Just remember, use the correct potato in all your recipes and you’ll be amazed at the difference it makes. Oh, and about internet web sites on cooking hash browns. You will find almost each will start out saying “Shred a Russet potato…” THEY’RE WRONG!!! Here’s the recipe I now use for my hash browns. As verified by the photos, you’ll see they are no longer grey, mushy or gooey but just right! Peel your potatoes. I use red skins. Verify that your oil is up to temperature. Place a shred or two near the edge where it is coolest. It should immediately and violently begin to bubble. * Note on counter top convection ovens. 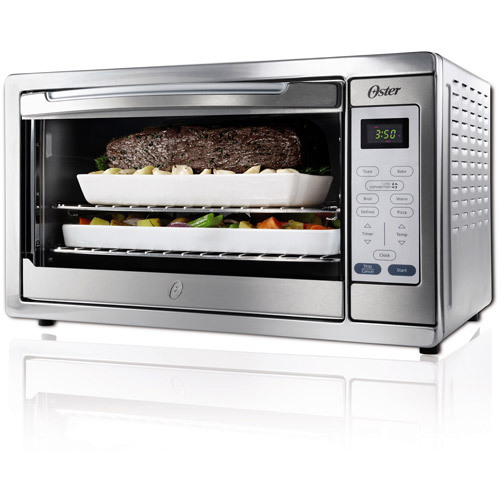 I purchased this Oster extra large convection toaster oven from Wal-Mart for less than $100. It uses much less electricity than my large oven. I questioned whether or not it could perform any where near as well as my Whirlpool ‘Gold series’ Accu-bake oven does. It does! I bake prefect bread, muffins, pizza, flat breads and more in it. I rarely give a product endorsement but in this case I will. It is worth every penny I spent. 3-5 medium potatoes (approximately 3 cups shredded). 1/2 tsp. salt then salt further to taste if desired when eating. 1/4 tsp. pepper then pepper further to taste if desired when eating. Add at least 1-2 Tbsp. butter or margarine to vegetable oil. 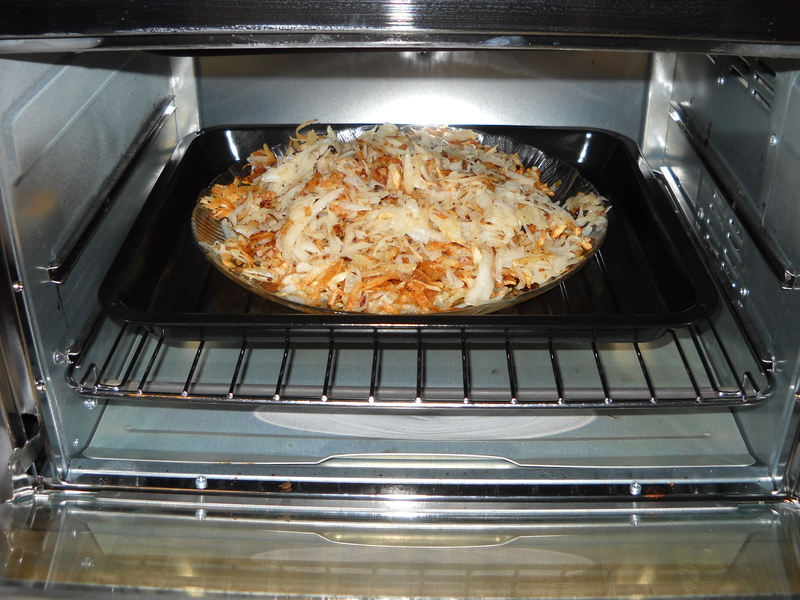 (hash browns should be cooked in oil 1/8 – 1/4 inch deep to cook completely all the way through). Wash and peel the waxy (not russets) potatoes. 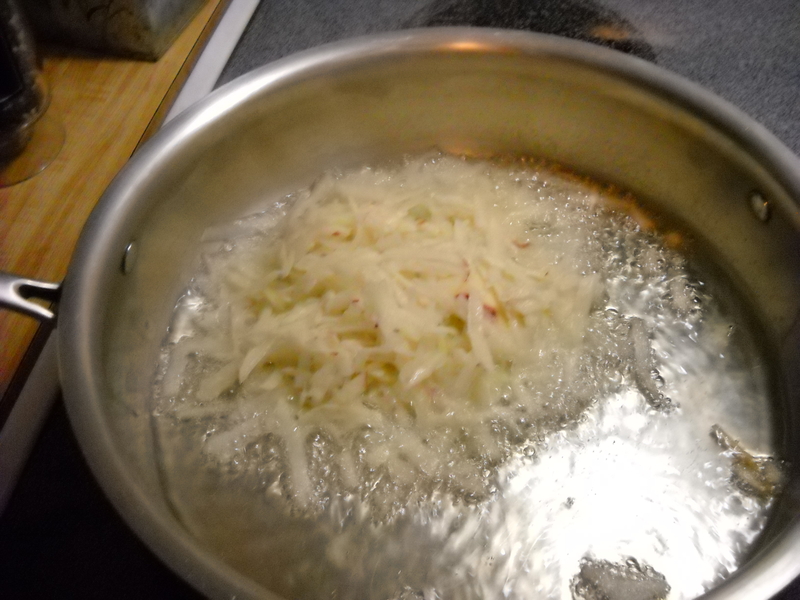 Use a cheese grater to shred the potatoes then place the shredded potatoes into a large bowl or pot. 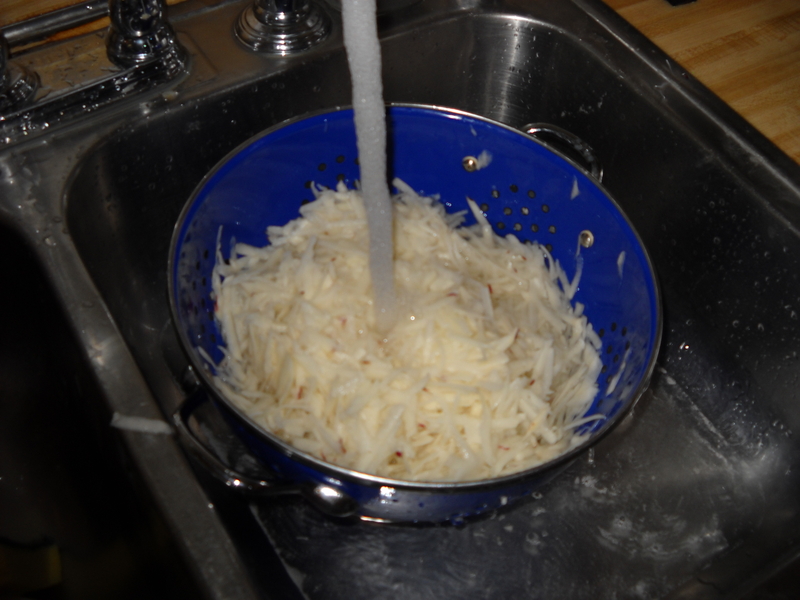 Fill the pot or bowl full of water, stir aggressively by hand and empty the water by pouring the potatoes into a colander. Repeat this process until the water remains clear when agitated. 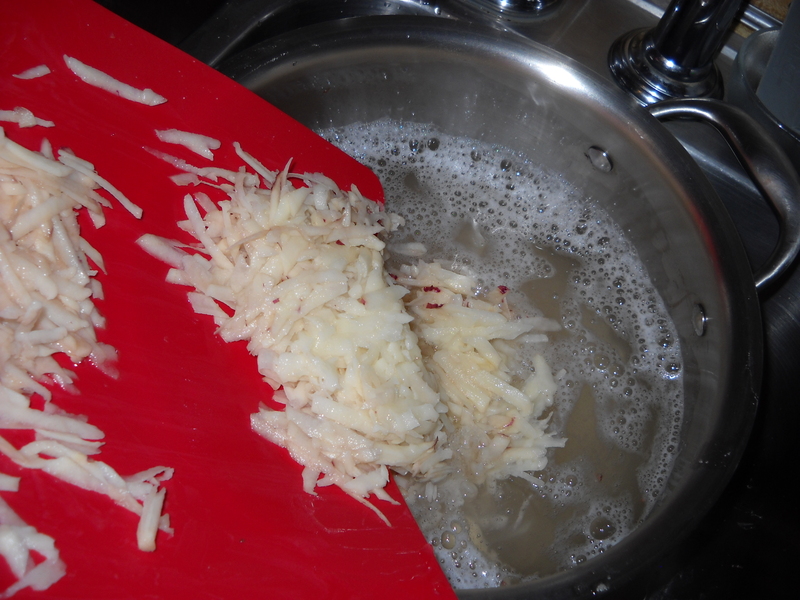 (three or four times) This will remove most of the starch which causes hash browns to become gummy, mushy and grey looking. Rinse the grated potato under cool water one last time in the colander. 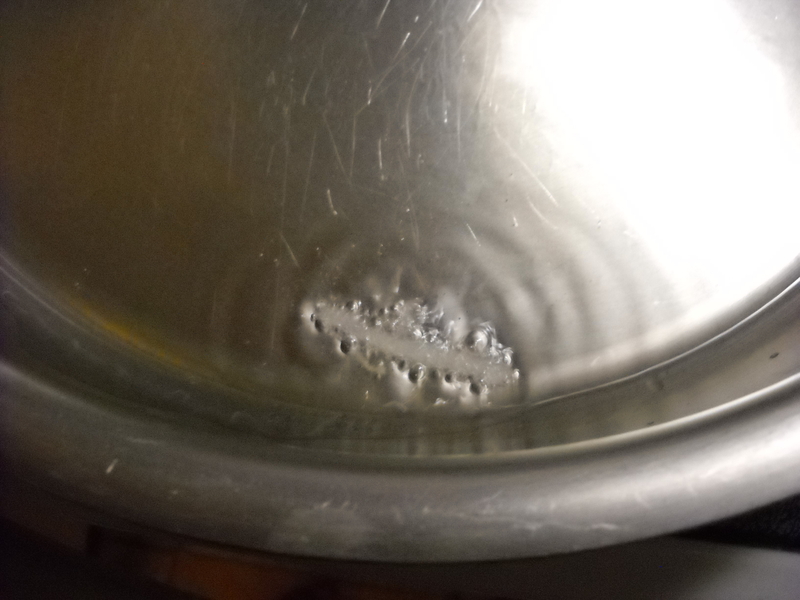 Press down, shake and press down again to remove excess water. Fluff and repeat . 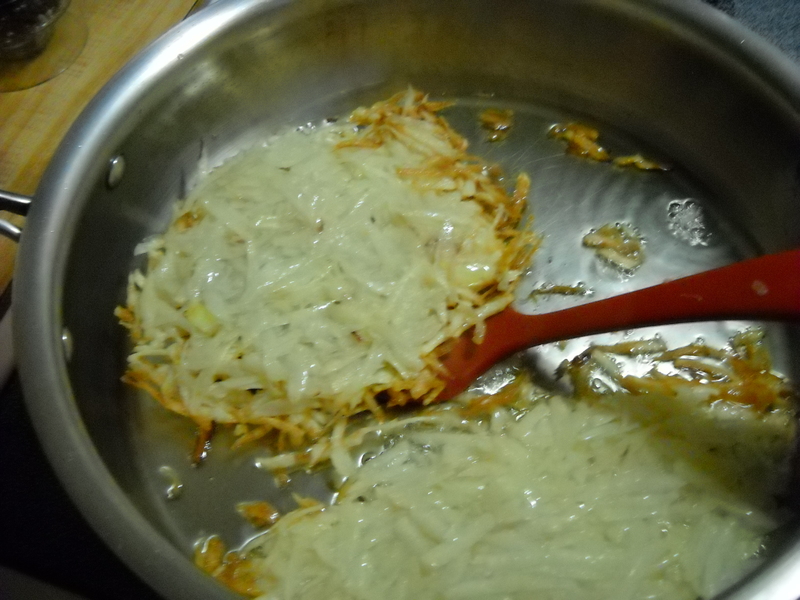 (Too much water will cause to hash browns to stick onto the bottom of the frying pan). 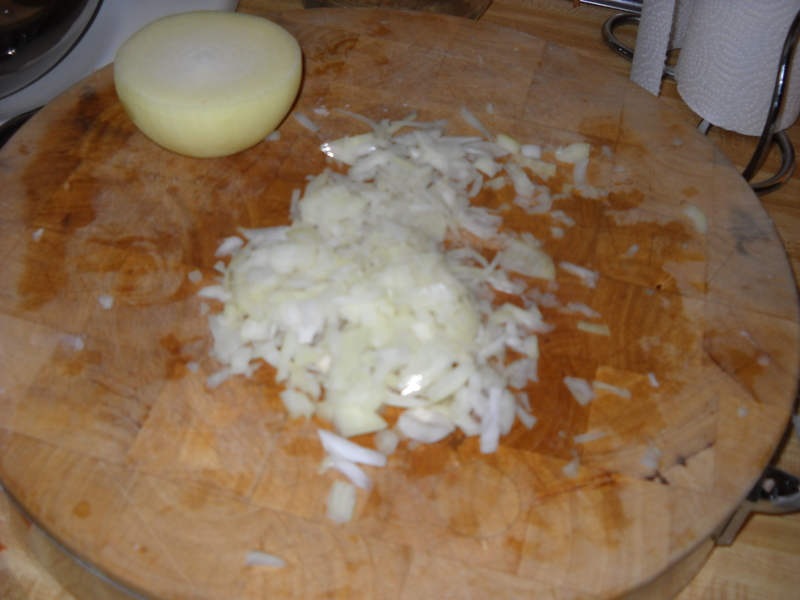 Dice the sweet onion and add to the colander of potatoes, mixing well. Add the salt the pepper and mix again thoroughly. 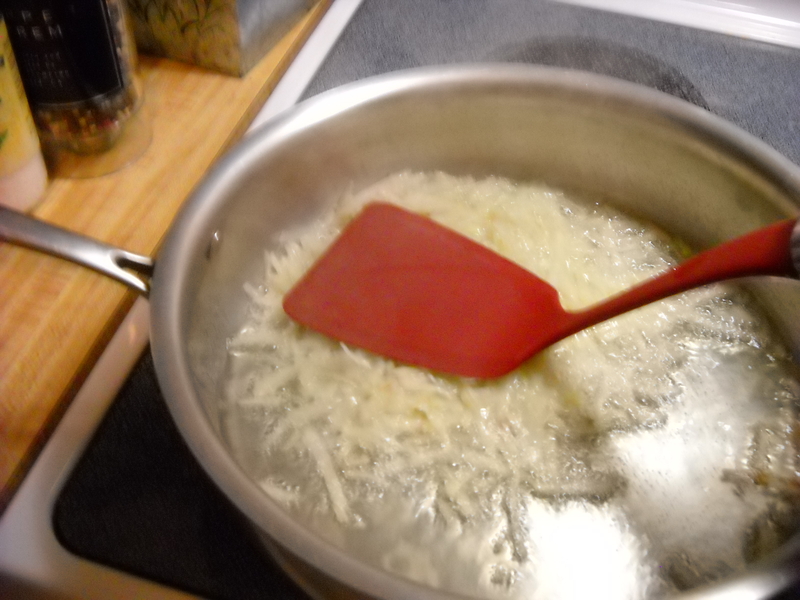 Bring to temperature the butter and oil combination in a large skillet over medium high heat. When the skillet is hot, (not smoking) add the potato mixture. Once your potatoes are frying, turn the temperature down to medium. (Test your oil first by dropping a few potato sprigs into the pan. 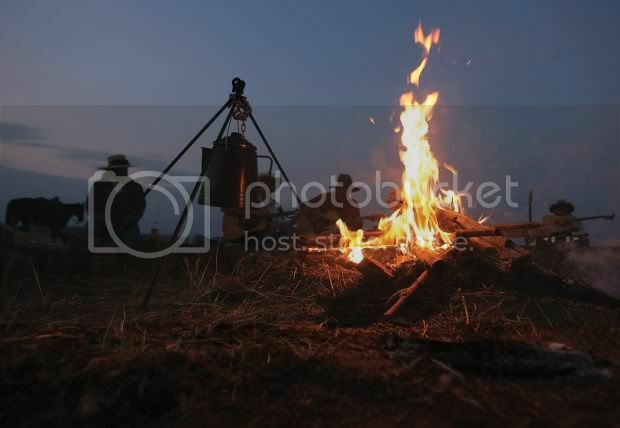 The sprigs should immediately and almost violently begin to bubble and boil). Using a spatula, flatten the pile of potatoes to desired thickness. Reduce the heat to medium-low and cook until the bottom gets pretty crispy; about 10 minutes. 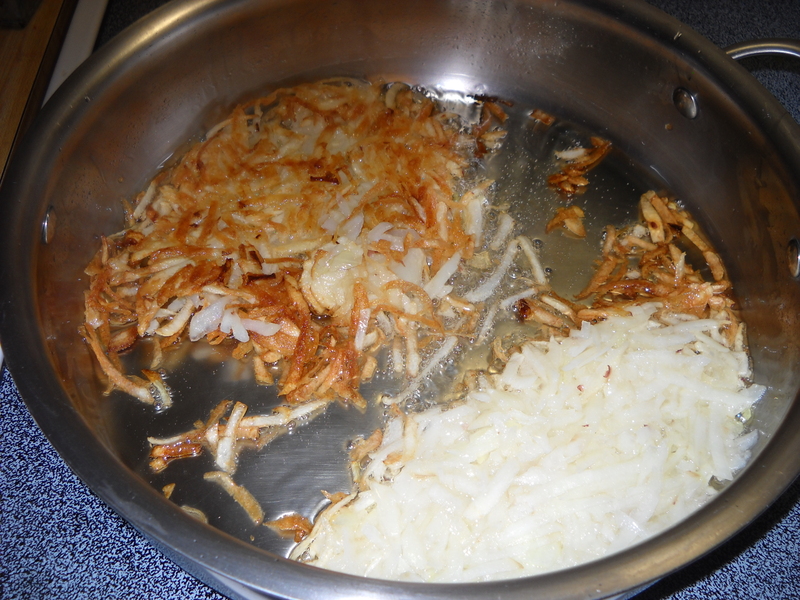 Flip the hash brown with the spatula, if too big, separate it into equal parts. Allow the other side to cook until very crispy; about 8-10 minutes. 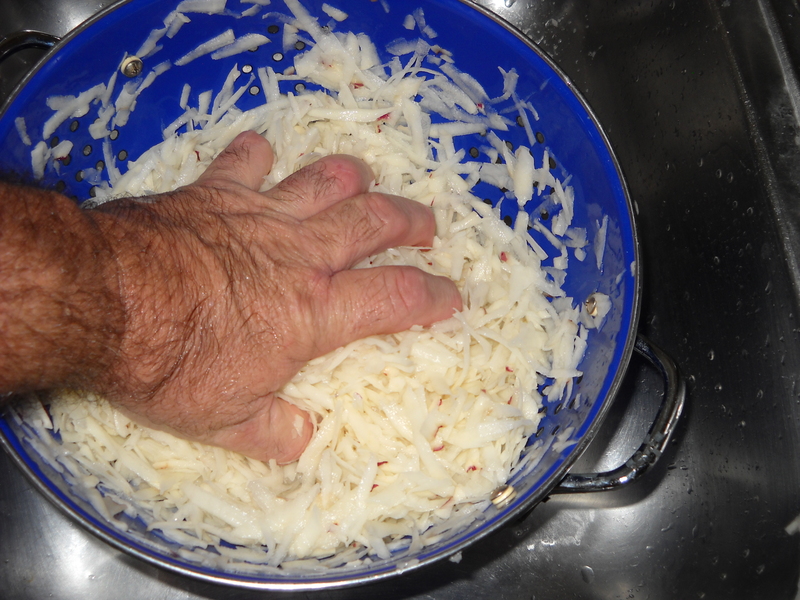 Repeat this cooking process until all the shredded potatoes are used. Potatoes that are not thoroughly cooked will hold oil, make sure the top and bottoms are nice and crispy. Remove them from skillet, place the photo perfect potatoes on your plate and enjoy ’em!